I love a good monogram and Marley Lilly has been my favorite place to purchase from. I had previously purchased a few things through them and loved every piece I received. They kindly sent me a monogrammed scarf to review and share my honest thoughts with my lovely readers. I don’t think it was until I got married that I really got into monograms, I do try to keep it to a minimum though. Once you look at everything they have to offer you won’t know what to choose. 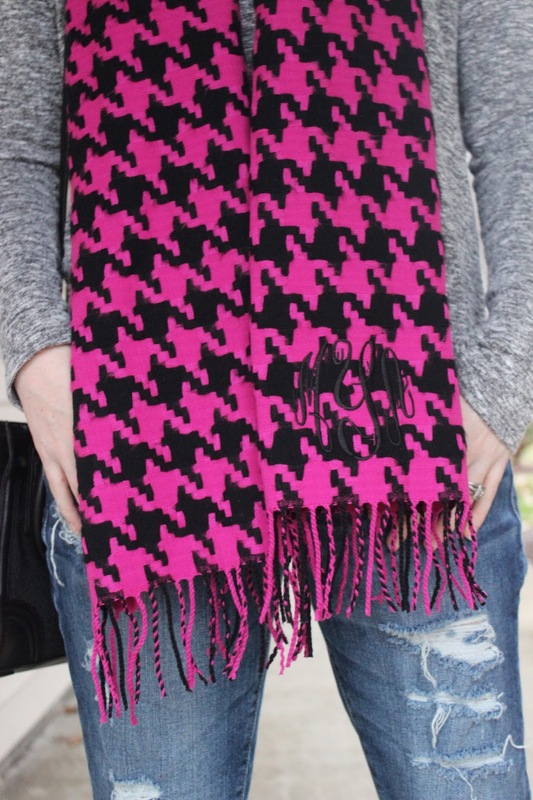 The scarf I got was a cashmere feel scarf in pink and black houndstooth. Let me tell you this scarf is incredibly warm and I got it just in time for our NYC and Philadelphia trip. My initials were perfectly embroidered on the scarf, although I wouldn’t recommend black thread if you do choose this scarf, it doesn’t show up very well. The scarf is great quality and worth every penny, just don’t spend too much time on the website or you’ll literally become a crazy monogrammer, if that’s even a thing. Not to mention this would be a great site to find some of those gifts you desperately need to find. *This post is brought to you courtesy of Marley Lilly. I received products from them to review. As always all opinions are honest & my own. Cute scarf, I love that its monogrammed. Right! I thought I was going crazy! Thanks for stopping by!